I started to worry this weekend when I realized we hadn’t reviewed a restaurant for March yet, and I was still recovering from throat hack. We were supposed to meet with our friends for Community Night last night at The Kitchen, but it just so happened that all three of the couples (including us) waited too late to make reservations and they booked up! Although I’m bummed because I love seeing those people, I was secretly glad because my tastebuds were not fully recovered. 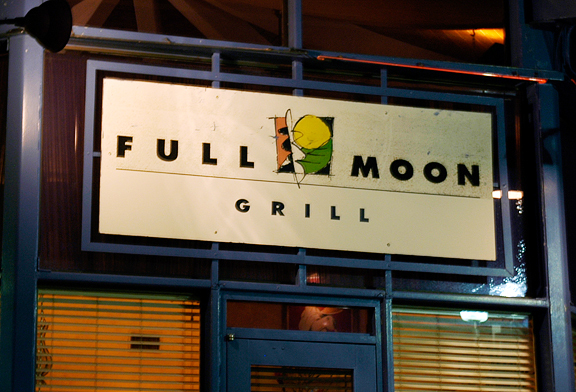 Tonight, I was feeling good and we reviewed Full Moon Grill, which I have to say, was awesome. Just sitting there eating this food, I fell in love with Jeremy all over again. I can’t explain why, but it’s so great to sink your teeth into something so amazing and look across at your sweetheart to see that expression of “holy hell, this is incredible!” on his face. We tried Full Moon Grill on the recommendation of two co-workers. 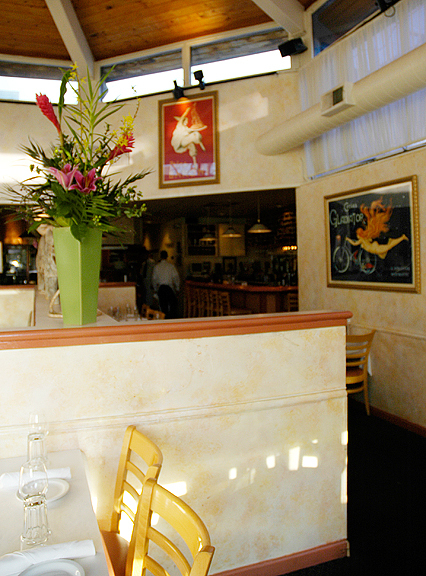 The style of cuisine is Northern Italian and the menu boasts a nice selection of seafood, meat, and pastas. The atmosphere is casual and the setting comfortable. Full Moon Grill’s wait staff was professional, attentive, and prompt (on our first visit there). We arrived right when they open (late dinners on weeknights are impossible because we have to get home in time to let the dog out) at 5:30. There was another party on the patio outside that eventually came in to dine. It was a quiet night, and I can’t help but wonder if the place would have been busier if it was on Pearl Street. I like that they include a glass full of crayons for the paper table covering. The presentation of the food was beautiful, yet practical. In some ways, I felt Full Moon Grill had an almost understated style for such incredible food. I like how relaxed it was. I think the food here ranks this establishment as one of the better restaurants in Boulder. Jeremy thinks this is ten times the quality of Mateo (he hates Mateo). We started our meal with bread and perused the menu. 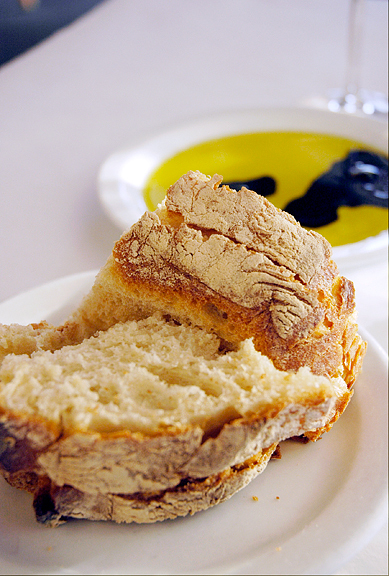 I like that the bread arrived warm, and was airy and soft in the middle with a substantial rustic crust on the outside. There were a couple of specials that night including a risotto with roasted chicken breast, and a grilled pork loin with soft polenta. It was tempting, but the regular menu was also loaded with amazing choices. We ordered drinks from the cocktail list. 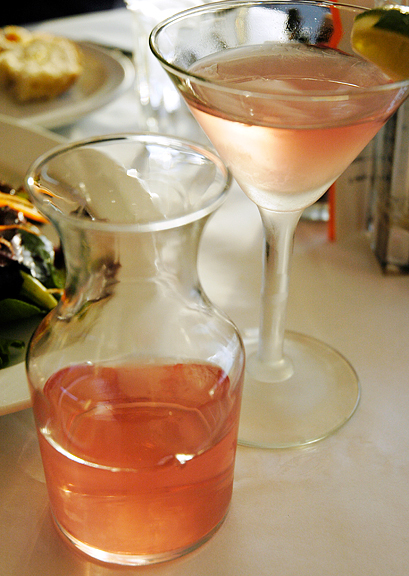 I got the Cosmopolitan Cezanne, which was nice and fruity for $7.50. Jeremy tried the Appletini for $7.00 which we both agreed tasted like cough syrup. I have to say that Dennis at the Brown Palace Hotel really does make the best darn Appletini ever. Luckily for Jeremy, he likes the taste of cough syrup, so he managed to finish it. He said he probably won’t order that ever again. 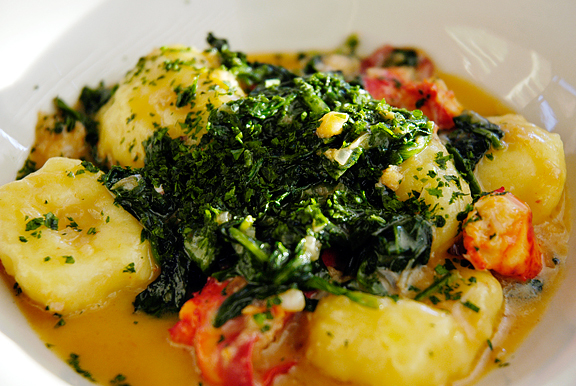 The first appetizer we tried was the lobster gnocchi ($10). You can order an entrée serving for $24. The food arrived quickly and it was steaming hot. I thought the gnocchi I had at the Kitchen was the finest gnocchi ever. Full Moon Grill’s gnocchi is just as good. Big puffy pillows of hot potato pasta melted in my mouth. The lobster pieces were tender and bursting with flavor. L’Absinthe could learn a thing or two about cooking lobster from these fellas. I think the combination of the vegetables, the pasta, the lobster, and especially the lobster reduction sauce, was a perfect marriage of flavors and textures. The other appetizer we ordered was the crispy Maine crab cakes ($10), which arrived at the same time as the gnocchi. The outside was crispy without a trace of greasiness. The inside held a mixture of delicate crab, celery, onions, carrots, and some spices. The flavors were subtle, yet immensely satisfying. 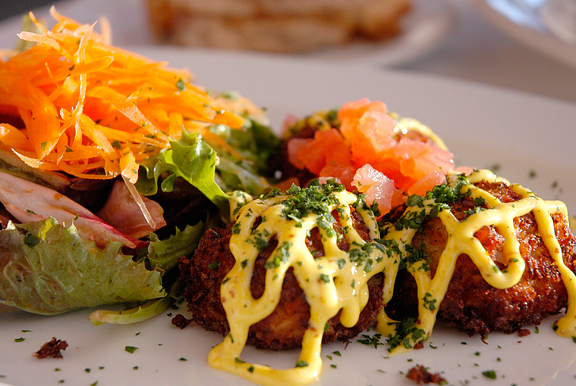 I liked the tang of the saffron aioli with the crab cakes. A nice green salad accompanied the dish and freshened the palate. My entrée was the crispy duck breast ($18) which I ordered cooked medium. It arrived in a fanlike array atop a bed of deliciously cheesy soft polenta, surrounded by a cherry sauce that was neither too sweet nor too heavy. The winter vegetables included sweet roasted parsnips and what I think were collard greens with a hint of bitter (the good kind). That was all topped with shredded baked strips of sweet potato. The components were each well done on their own, but eaten together, the combination was heady and satisfying. Jeremy ordered my runner-up entrée – the pan seared sea scallops ($24). These three giant beauties were fried to perfection. The outside was browned and crispy the way dry scallops should be when seared (Naked Fish – are you paying attention here?). The insides were tender, full of fresh flavor, and essentially like butter. 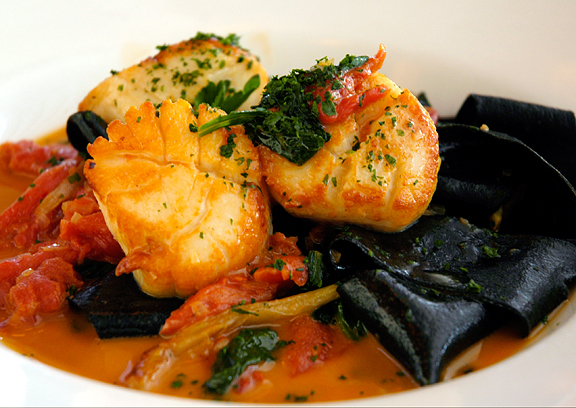 The scallops were served over a bed of pappardelle nero – extra-wide squid ink pasta cooked al dente. I couldn’t tell if there was a flavor to the pasta because the lobster broth it was served in was so damn good. I mean DAMN GOOD. The fennel and tomatoes were a nice accent to the dish. I had part of my entrée boxed so I could try dessert. Imagine my delight when I saw they had vanilla bean custard panna cotta ($6) on the menu. 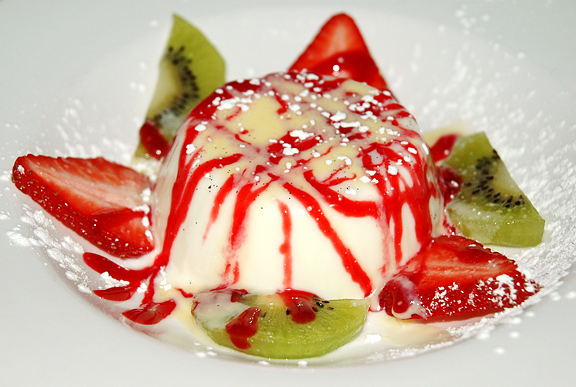 It was presented with slices of strawberry and kiwi, drizzled with a smooth raspberry sauce. The panna cotta was light and delicate. I really enjoyed it, but in the end I think the panna cotta with the drunken prunes at The Kitchen still wins my tastebuds over, just by a hair. As desserts go, this one was fabulous and I would happily order it again. I don’t think Jeremy has ever consciously ordered a non-chocolate dessert in his life. Why change now? He debated between the vanilla gelato drowned in espresso and whipped cream and the mousse. 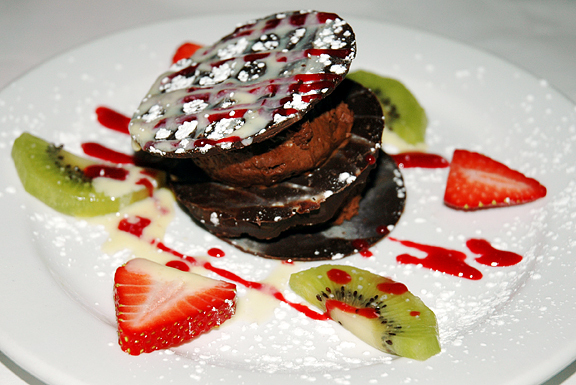 He wound up with this gorgeous cinnamon chocolate mousse ($7) nestled between three wafers of high quality dark chocolate (very smooth chocolate, not too sweet, and very pleasing to the mouth) with some token fruit. The mousse was very thick and smooth – dissolving away into bliss once it reached your mouth. This was accompanied by a cafe au lait ($2.25). We enjoyed Full Moon Grill so much that we met with two other couples to dine there on Dining Out for Life (April 27, 2006). The food was excellent as usual, but the service was less than ordinary. Our waitress filled our water glasses only once the entire evening and had to be asked for dessert menus. It was a busy night and she was clearly distracted – and not attentive at all. But the real problems began when we asked that our bill be split three ways on our cards. She came back and charged each couple half of the bill (so 150% of our bill). When we pointed this out, she did not apologize, but disappeared for over 15 minutes. When she returned with the correct charge, she had given our friend someone else’s credit card. He mentioned this to her and she grabbed the card and ran off after someone in the parking lot. When she returned, she did not come back to our table. After another 15 minutes of waiting, our friend went up to inquire about the status of his card. Apparently, it was gone. Eventually the manager was involved and he told our friend that there was nothing he could do about it at the moment, that he had customers to attend to. I’m not sure what he thought we were – the help? What astounded me was that the manager made no effort to 1) apologize for losing a customer’s credit card 2) try reassure our friends that he would remedy the problem 3) be polite about it. At one point he even had the nerve to shout, “What do you want me to do? !” I am unclear to this day on how this man ever became a manager. The waitress was completely useless. We left quite disappointed and very angry – vowing never to dine here again. If I wanted service like this, I could have gone to my HMO (note: in retrospect, having dealt with cancer treatment through my HMO, I now feel that the HMO has much better service than FMG that night). The next day the OTHER manager called our friend and apologized profusely, refunded the charge, offered a $60 certificate to the restaurant, sent a handwritten letter of apology from the first manager, promised that Full Moon Grill does not do business this way, and said the credit card had been returned by the customer who had erroneously received it. This restored our faith in Full Moon Grill to a degree. But I am certainly more inclined to go elsewhere in light of that fiasco. The rating was hence downgraded. 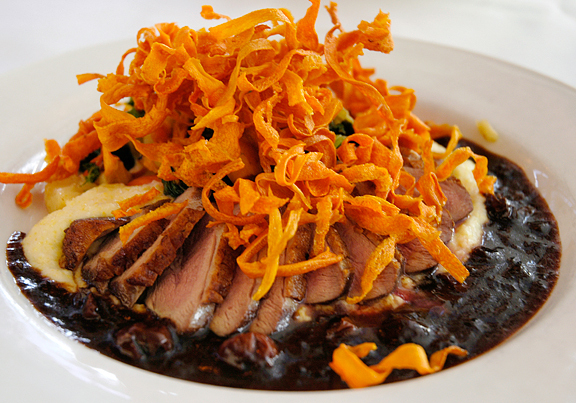 A restaurant is more than just the food it serves.